Acetyl L-Carnitine is an amino acid that helps with cellular energy production. It's commonly used to boost mental energy and support cognitive functions. 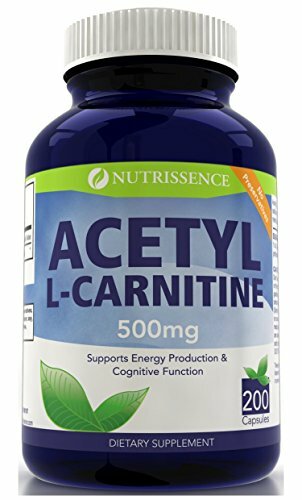 Nutrissence Acetyl L-Carnitine comes in 200 servings of 500mg or 100 servings at 1000mg. Contains NO GMO ingredients, preservatives, artificial flavor or color, magnesium stearate, milk or milk derivatives, lactose, salt, sodium, sugar, soy, starch, wheat, yeast, corn, or gluten. Nutrissence Acetyl L-Carnitine is made in the USA in an FDA approved facility following cGMP guidelines. MENTAL ENERGY & COGNITIVE FUNCTION SUPPORT: Acetyl L-Carnitine, also known as ALCAR, is generally used to boost mental energy and support cognitive functions. CELLULAR ENERGY PRODUCTION SUPPORT: Acetyl L-Carnitine is an amino acid that helps with cellular energy production. CONVENIENT CAPSULE FORM - Contains 200 capsules or 200 servings of 500mg of Acetyl L - Carnitine or 100 servings at 1000mg. NO PRESERVATIVES & NO GMO - Contains NO GMO ingredients, preservatives, magnesium stearate, artificial flavor or color, milk, lactose, soy, or gluten. If you have any questions about this product by Nutrissence, contact us by completing and submitting the form below. If you are looking for a specif part number, please include it with your message.